According to data from the Global Footprint Network, August 13, 2015 was officially “Earth Overshoot Day.” We have now used nature’s entire budget for the year. Global Footprint Monitor tracks humanity’s demand on natural resources against nature’s ability to accommodate that demand – also known as biocapacity. Carbon sequestration, natural carbon sinks for increasing carbon emissions, accounts for more than half of the demand on nature. In 2000, Earth Overshoot day occurred in early October. 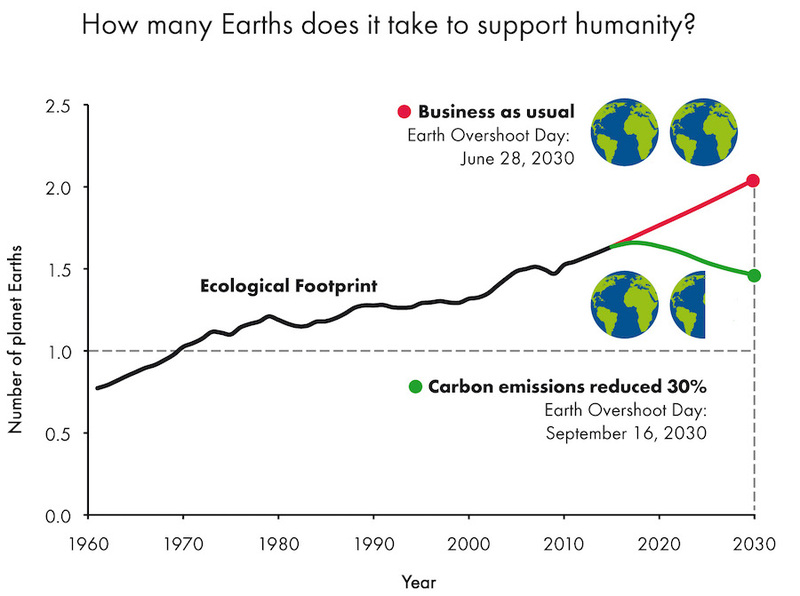 Under a “business-as-usual” scenario, by 2030 we will overshoot Earth’s biocapacity on June 28. Currently it takes 1.6 Earth’s to meet the demands humanity places upon it. We only have one.